LS-DYNA presents the greatest flexibility and power of any FEA based analysis software in the world. Its rate of innovation is truly amazing as it has expanded its capabilities over the last two decades into multi-physics from ALE, CFD (compressible and incompressible), frequency domain dynamics (PSD fatigue, modal frequency, rigid-body dynamics), NVH, electromagnetism, conjugate heat transfer, mesh free methods (EFG, SPH), discrete element method, complete fluid-structure, DEM-structure, SPH-structure capabilities and I'm sure I missed even more capabilities. At Predictive Engineering, we pride ourselves in the ability to conceptualize complex structures and systems into accurate numerical models. Given the complexity of LS-DYNA, our experience gained over the course of 20+ years allows us to quickly provide our clients with the right balance between cost and accuracy. At Predictive Engineering, we are continually honing our skills as nonlinear FEA consultants and we make it a point to attend training events and the yearly LS-DYNA Conference (May 14-16, 2019 in Koblenz, Germany). Along with this effort, we also teach a yearly course in LS-DYNA Analysis for Structural Mechanics. Our LS-DYNA Case Studies represent just a few of our more important projects and they provide a bit of insight into our ability to get you the right simulation results, quickly and economically. We hope you enjoy them and welcome to Predictive Engineering! An unusual name for this project to provide a bit of mystery as to what we were actually doing. 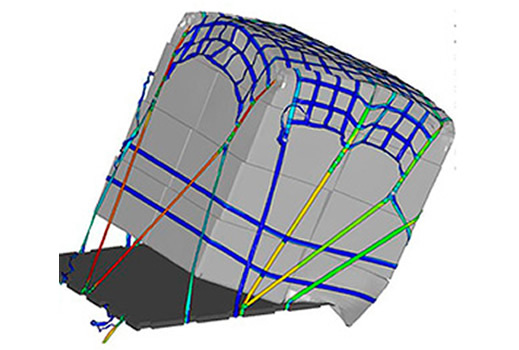 Although we have done several consulting projects that involved the idealization of cargo straps into FEA models employing shell elements for the fabric and beam elements for the connecting hardware (loops, hooks, D-Rings, etc. ), this project was even more complex since the straps were pre-tensioned to set tension loads prior to the 60 MPH test. Just to make more interesting, the cargo of interest was placed on top of an polyurethane mat that covered the aluminum pallet. The material list for this model then included: fabric, rubber, aluminum and steel and all extended into their respective nonlinear ranges. As for the modeling process, simply wrapping the straps around the cargo required a separate analysis with the final strap configuration (displacements) morphed onto the final model for pre-tensioning. The transient sled test was the easy part. Results from this work were used to assure our client that their cargo would stay put on the sled and not fly off into space causing some sort of unspecified serious damage. This was just your standard drop-test analysis of first-responder hand-carried medical device. Since it used an exoskeleton of PC / ABS molded components around various electronics and a heavy battery pack, our client was a bit nervous about whether it would survive a drop from four (4) feet. This is the type of FEA nonlinear consulting that Predictive Engineering has been doing for about 20 years and really presented a very little challenge. The polycarbonate (PC) and acrylonitrile butadiene styrene (ABS) blend was modeled as an engineering plastic with a yield strain of 4% (Bayblend FR3010). The model was idealized using shell elements for plastic molded parts and solid elements for the thicker elastomeric corner protective “bumpers”. The model was then dropped on its four corners and then front and back. Results suggested several design improvements to prevent corner damage and also internal damage at the battery mounts. Extension springs are well-known mechanical devices that can be ordered with specific tensile preloads. From a modeling perspective, they represent a very interesting nonlinear response and if the spring is bent or twisted, then its contact behavior becomes of importance in its mechanical response. Our client came to us based on our experience in prior projects, although they have in-house FEA capabilities, the complexity of this project merited out-sourcing. The simulation of the extension spring was done via LS-DYNA’s *INTERFACE_SPRINGBACK_LSDYNA keyword command. A FEA model of the extension spring was made using beam elements and then stretched. When the desired preload was reached, the analysis was stopped and the beam stresses dumped out into dynain file via the _SPRINGBACK keyword. This file was then stripped down to just the *INITIAL_STRESS_BEAM results and used as an *INCLUDE file in the full FEA model of the medical device. In the full analysis, the device was built up using rigid bodies to capture its swing motion with the only deformable parts being the beam elements used to model the extension spring. Results were validated against the client’s experimental data and was found to be spot-on. 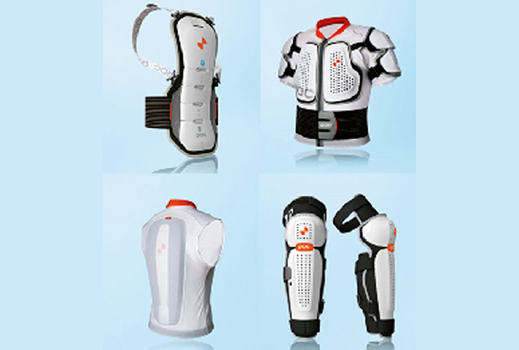 With this validation, the spring stresses could be interrogated with high confidence and used to improve the fatigue life of the device. Our client had several evaporative vessels in service, that over the years had accumulated sufficient shell side residue that was hindering their efficiency. Given that the tube bundle section of the vessel was 30 m long and 4 m in diameter, the only economical manner to clean out the residue was determined to flood the vessels. The challenge was these vessels were never designed to be flooded and, without some sort of documentation or design modification, the only alternative would be to scrap the vessels and install new multi-million dollar evaporators. Through several rounds of finite element analysis (FEA) it was determined that the vessel would fail upon being flooded. At this stage, in collaboration with our client, it was determined that the lower tube sheet could be supported and with some minor reinforcements (e.g., nozzle repads), the vessel could be flooded and still fully comply with ASME Division 2, Section VIII specifications. The tubesheet support involved cross-bracing the bottom of the tubesheet using nonlinear contact between the support and tubesheet. It should be mentioned that the vessel was found to comply only via the plastic collapse section of the ASME code. To verify that the design would be robust, the hydrostatic pressure load was ramped up to 3x its flooded state, exceeding ASME’s requirement of 2.4x. For conservativeness, the material law assumed perfectly elastic-plastic behavior. At the end of this analysis, our client was confident that the vessel could be flooded and work is underway to build the support structure and then proceed with the cleaning operation thereby saving their company millions of dollars. A injection molding company was in the process of designing a new rebar support seat for its end client. Given that the production volume would be in the hundreds and thousands of pieces, it seemed reasonable to obtain some FEA anti-failure insurance. The nonlinear FEA modeling was necessary given the material’s nonlinear elastic response and the use of snap-fit joint between the base and upper chair segments. The modeling (FEMAP) was quite simple using client supplied geometry and then using a mixed mesh approach of hex elements in the snap-fit regions and then a tet mesh in regions of lessor interest. Mesh transition was done using _TIED contact and verified by turning off the grid outlines and looking for a smooth stress transition between the meshes. Results indicated that the design needed significant revision to achieve the client’s load requirements to prevent premature snap through and collapse of the seat. This project leveraged several key skills sets within our consulting services: (i) fracture mechanics; (ii) comminution expertise from +10 years at the U.S. Bureau of Mines; (iii) idealization of complex structures into predictive numerical models; and (iv) importantly, +20 years of LS-DYNA experience through hundreds of consulting projects. This project started with the premise that we could use the discrete element method (DEM) to model the comminution of the rocks. After a few pilot models, we determined that to capture the correct stiffness and stochastic characteristics of rock fracture, the time step for the analysis would be too small for practical engineering work. We then switched to modeling the rocks using standard Lagrangian elements but with a twist. The twist is that LS-DYNA *MAT_24 material law allows the user to define a stochastic variation of the elastic modulus, yield stress and plastic strain (among others). By setting realistic ranges for these parameters, rock fracture could be simulated that matched well with the Bond Work Index. 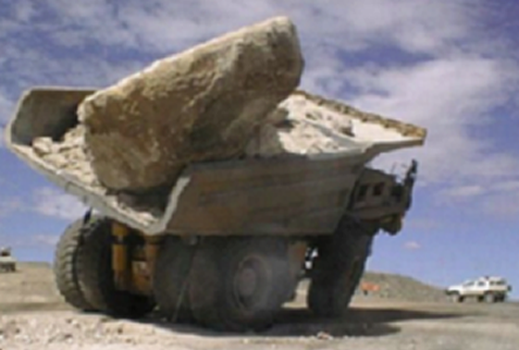 With this calibrated virtual rock pile, a series of comminution studies were carried out on a high-speed cone crusher. The kinematics of the cone crusher were fully represented using rigid bodies. With this configuration, rocks were crushes while measuring crushing efficiency via top frame bounce and amperage draw (horsepower (HP)). Results from the model correlated well with in-field measurements of cone crusher power draw, final rock sizing and wear patterns on the liners. Although the model is highly nonlinear, run times were nominal given that the only deformable bodies in the model were the rocks while the cone crusher parts were rigid bodies, albeit providing contact to the rock parts and torque outputs on the main drive. This work was sponsored by the US Army’s Natick Soldier Systems Center to investigate additively manufactured lattice structures for improved blunt impact protection for helmets. The idea is simple enough, modern helmets are designed to deflect or mitigate the impact forces due to bullets (high velocity) but not so much for blunt force impacts (lower velocity). In military operations, blunt force impacts are common, albeit sometimes accidently, due to falls or in the rush to enter-exit buildings and vehicles. In combat, flying debris also present challenges to helmet designers where the impacts can be both high- and low-velocity. 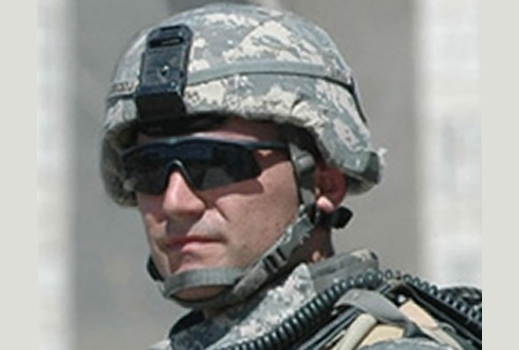 Our work was to set the foundation for the exploration of polymeric 3D lattice structures to create the next generation of energy-absorbing helmet liners for military applications. Current foam liners, whether multi-layer or sculptured, all exhibit more-or-less the same energy-absorbing response which is fine for high-energy impacts but lacks the sensitivity for low-energy impacts. If one can move away from the use of foam and toward that of a 3D polymeric lattice structures, then it should be possible to engineer a helmet liner to have a more variable or tailored energy-absorbing response. To create such structures, the additive manufacturing process was used. The first phase of this test program was to develop a validated FEA model that could be used to predict the impact response of additive manufactured 3D lattice structures. The additive material used for the lattice structure was a methacrylate photopolymer. Standard static compression, tension and bulk modulus testing was performed on 20 mm thick blocks. The same samples along were subjected to impact testing at various strain rates. The static and dynamic data was then fitted onto a series of strain-rate dependent curves. The final *MAT_181 law was then validated against these same coupon tests and shown to have good agreement. This material law was then applied to a 3D lattice model for virtual impact testing. Unfortunately the full-on lattice simulations showed no correlation between FEA and test. Although the material law development was accurate to the coupons and the FE model was verified to other numerical tests, it was reasoned that the material characterization had radically changed from large sample (centimeters) to lattice structure (millimeters). Although this project was a spectacular failure, it did advance our understanding about the challenges of modeling polymeric additive materials. Moving forward, we will be working on a new suite of mechanical tests that would be scale specific to lattice structures… but that will be next year’s conference paper. A core challenge to any finite element analysis (FEA) is figuring out loads and how to apply them. For static events, it is usually straightforward. In the case of durability testing, loads are obtained from accelerometers mounted on test vehicles that are driven for hours, if not days on test tracks or routes that hopefully replicate the most severe road conditions possible. These accelerations can then be numerically processed and used for various frequency domain analyses such as a random vibration analysis (i.e., PSD), a frequency response analysis, or steady state dynamics. Although powerful and useful, these solution sequences are all based on the linear normal modes response and do not account for the nonlinear evolution of the structure as it shakes, rattles and rolls. As for a nonlinear material response, forget about it. Our approach is to describe how one can take the full acceleration time history and with little sacrifice in accuracy, perform a nonlinear, transient dynamic implicit analysis over a time span of 5 to 10 seconds. The reason for choosing implicit analysis is based on two factors: (i) the necessity for finely detailed meshes in regions of high-stress, and (ii) quick solution times. A series of bus seats was analyzed using this technique and showed good validation against test track data. From a simulation viewpoint, this work could have been accomplished without the use of the implicit solver since run times were in hours whereas trial explicit runs indicated run times in days on equivalent hardware running with 32 CPU-cores. Vibration is the enemy of high-resolution scanning electron microscopes and great lengths are taken to prevent ground motion from being transferred to the equipment. Placing the equipment on a massive isolator-mounted table is effective is preventing vibrations from effecting SEM results but then requires restraints to prevents excessive motion during a seismic event. The objective of this analysis was to ensure that the restraint brackets meet seismic requirements of SEMI-S2 (UBC 1997) and the International Building Code (IBC), and evaluate the bolt and anchor strength per HILTI guidelines. A finite element analysis model was constructed and analyzed to determine the bolt forces and the ultimate load of the brackets. The results from this analysis work allowed the customer to choose an appropriate material for the brackets and size the bolts and anchors. LS-DYNA FEA consulting services, training and sales have been an integral part of Predictive Engineering for more than 15 years. In recent project work, we investigated the blast resistance of several large generator housings. The blast pulse was determined by ConWep calculations given the TNT charges and distances from the housings. Although LS-DYNA has several built-in methods for simulating blast loading (e.g., *LOAD_BLAST_ENHANCED and *PARTICLE_BLAST), most far-field air blast load calculations of exposed structures can be done as shown in the graphics below. Results from this investigation allowed our client to decrease the weight of their design to such an extent, that analysis costs were easily recovered and that the housings would meet all infrastructure protection requirements at the base. When a local manufacturer of off-road vehicle accessories was tasked with developing a new drivetrain technology for a large automobile manufacturer, the need for FEA structural analysis was apparent. The product is a Center Axle Disconnect (CAD), which is responsible for a vehicle’s transition between four-wheel drive and two-wheel drive. One of the major concerns with the design is the repeated impacts between metal and plastic components. The disconnect shifting at very high speeds results in high impact situations. With these impacts, durability is a critical concern. Using LS-DYNA, the impact events were analyzed as fully transient-dynamic events. Impact velocity was calculated via conservation of energy based on the transmission spring preload. This was applied to the FE model as an initial velocity and the analysis started just before impact. Not only did the analysis results provide stress values for the components during the impact event, but also real-time visualizations of the transmission components impacting, sliding and rotating through the travel. This analysis work helped guide the design of rubber O-rings that allowed the transmission to operate at high speeds while reducing stress on the plastic components. Carbon fiber composite materials are continuing to see increased usage in sporting equipment: helmets, fly rods, bike frames, golf clubs, protective gear, hockey sticks and skis just to name a few applications. While the high strength-to-weight ratio is the main appeal of carbon fiber laminates, they also provide the ability to adjust stiffness characteristics by modifying the fiber orientation, ply thickness and number of plies. This was the focus of a recent LS-DYNA consulting service project with a major sporting equipment manufacturer designing a shoe with a carbon fiber sole. While the product needed to be light weight and capable of large deflections, it was important to fine tune the stiffness of the sole under different loading conditions. Before exploring new designs, an existing prototype was subjected to several laboratory tests. These tests were recreated using LS-DYNA and simulation incorporated the full nonlinear behavior of the sliding contact between the shoe plate and the test fixtures. 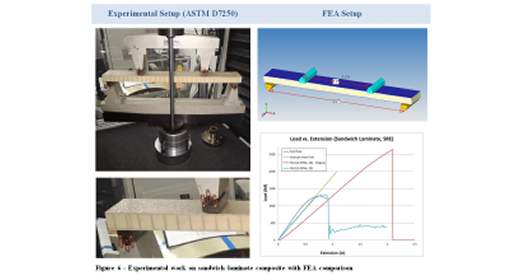 LS-DYNA’s MAT_54 material model allowed the mechanical properties of composite to be calibrated to test data before being used as predictive model for potential designs. Working with this simulation software allowed the client to perform virtual testing on multiple geometries and layups without generating physical prototypes. Cargo nets are extremely useful mechanical devices to securing loose items or bulk cargo during flight. Interesting enough, how one designs the net can greatly influence how load is transferred from the net’s webbing into the aircraft’s anchor points. 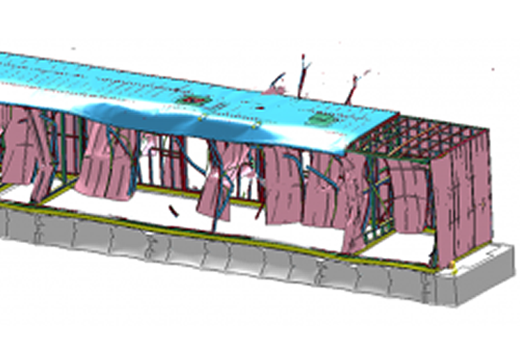 The client chose Predictive based on our prior FEA consulting service work using cargo nets to tie down boxed cargo onto aircraft shipping pallets. In this project, the client was responsible for the design of the cargo net attachment points onto the aircraft’s frame. Ideally, we wanted to ensure that the loads were as close as possible to be evenly distributed. That is, if the cargo net had 12 attachment points, the goal was to have each frame attachment point bear 1/12th the load. In practice, this was very difficult to achieve given the net’s dynamics during flight and emergency landing. The loose cargo tended to accumulate near the floor of the aircraft, putting higher load on the floor anchors as versed the roof anchors. 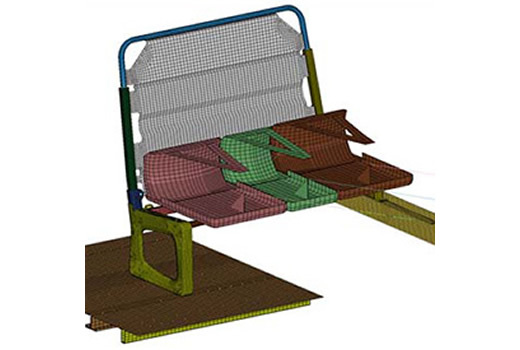 The complexity of the FEA work was due to the nonlinear stretch and deformation of the polyester webbing and how the cargo net would deform to accommodate the bulk profile of the cargo. The transport plane used a combination of nets and each net was optimized to achieve as nearly as possible uniform anchor loads. 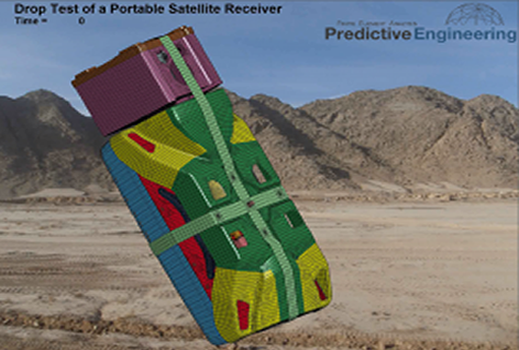 Since the Federal Aviation Administration (FAA) prefers that emergency landing load analysis be performed statically, the cargo net analysis was run using the implicit solver within LS-DYNA. From start-to-finish, we were able to reduce single-anchor reaction loads by approximately 50% by careful redesign of the webbing pattern. This work represents the culmination of perhaps a decade of FEA simulation work for this client. After years of performing “good-enough” simulations of the braze process, Predictive Engineering was given the opportunity to do a top-to-bottom complete nonlinear simulation of the braze process. The model was exercised from room temperature up to the braze material’s eutectic melting point around 700C and then back down to room temperature. Metallic and braze materials used temperature dependent elastic modulus, yield stress and CTE values. For example, at 700C, the braze material has a very low elastic modulus and its yield stress is near zero since the braze has recently solidify. On the metal side (titanium or stainless steel), the modulus, yield strengths and CTE’s do vary as the structure cools to room temperature and were incorporated into the FE model. The ceramic materials (alumina or zirconia) are basically inert within the temperature range of interest. The braze and metallic materials were simulated using a specialized material formulation (*MAT_188: *MAT_THERMO_ELASTO_VISCOPLASTIC_CREEP) which allowed for temperature dependent mechanical and thermal properties. The braze layer was inserted in-between the ceramic and metal components using tied contact since each component used a different mesh density. The final model was then analyzed using the implicit solver within LS-DYNA MPP Double-Precision. At room temperature, the residual stress prediction aligned reasonably with prior work albeit with lower stresses. The ability to more accurately capture the physics of the problem was very useful to the engineering team since some occasional failures of the ceramic-metal components had been noted and could be directly ruled-out since the FE model showed that the residual stresses were not driving the failures. In the modeling world, knowing what you know with greater confidence is an extremely useful piece of information. Additional FEA consulting is planned to investigate other geometries and explore different braze geometries. Our client wanted to understand the ultimate impact characteristics of their new ripper point design. In field experiments, they had experienced point breakage when the ripper point had impacted large rocks during field tilling operations. Although the point is spring loaded, the impact was severe enough to break off the wing edges. The ripper point material was a carbidic austempered ductile iron (ADI) and although it possess favorable wear characteristics, its toughness is quite low. Ideally, the designers hoped that ripper point failure could be prevented by using a low-strength shear bolt but this proved troublesome. Given the low-speed of the impact event, the analysis was run using the implicit solver within LS-DYNA. Failure loads were determined by slowly loading the point based on assumed rock impact angles (direct and angled). Once element erosion started to occur, the ripper point would fail catastrophically. Recommendations from this included a redesign of the ripper point and the use of a smaller diameter shear bolt within the spring-loaded system. Material optimization was also discussed since the use of carbidic ADI can be challenging given its low toughness. A durability analysis was performed of an automotive front-upper tie rod. This is about as simple as it can get except for their requirement to access the low-cycle fatigue life of the tie rod. Within the automotive world, it is common to bracket the performance of critical parts based on their response to overload conditions and then verify their classic linear load response. In this project, the boundary conditions were variable and required contact to be enforced between the connecting rod and the joint pins since multiple load cases were specified and it was just easier to let the tie rod find its own equilibrium. The material model for the tie rod analysis was based on common forged steel having a minimum yield strength of 420 MPa with an ultimate strength of 515 MPa and 18% plastic strain to failure. However, the client also requested that specialized materials be used for the spacer sleeve & tube and for the eyelet and clevis. Under the low-cycle load cases, extensive plastic deformation was noted in the tie rod and this was expected. The objective was to determine if the tie rod could survive after severe impacts and still return in serviceable condition. Given the material modeling and the interesting nonlinear behavior this LS-DYNA consulting project still provided us with some surprises and challenges. Storage of acids is commonly done in vertical polyethylene tanks. For ease of connections and other storage considerations, a polyethylene pad is provided to keep the outlet nozzle off of the floor and also ensure that the tank settles flat. Our client was interested in assessing their current 5,000 gallon tank given the ASTM D1998 Standard Specification for Polyethylene Upright Storage Tanks. The specification in essence de-rates the polyethylene’s nominal yield stress of 3,800 psi down to 600 psi. However, code interpretation states that this stress is only applicable to the calculation of hoop stresses since its intent is to prevent long-term creep failures. Given this code flexibility we classed the tank vessel to meet the 600 psi hoop stress and then allowed other localized stress concentrations to exceed 3x this value per ASME Section VIII, Division 2 rules. Although the analysis might be considered linear, the tank rests on a hollow pad where the internal structure is a series of hemispherical domes. As the tank is loaded, it pushes down on the top of the pad, which in turns contacts the top surfaces of the domes. Given the complexity of the contacting surfaces and the nonlinear deformation nature of the low elasticity rotomolding crosslinkable polyethylene (E=90,000 psi), the resulting analysis was highly nonlinear. Using the implicit solver in LS-DYNA MPP Double-Precision r8.0.1, the analysis quickly converged and readily scaled using more CPU-Cores. Final results indicated that the tank and pad were well designed for the long term storage of heavy fluids (e.g., specific gravity > 1.8). This was one of Predictive’s marquee projects and selected results were published in the 14th International LS-DYNA Users Conference “Broad-Spectrum Stress and Vibration Analysis of Large Composite Container.” Using one FE model, we were able to run the complete gauntlet of nonlinear analyses from explosive depressurization CFD calculation to various nonlinear static loads to explicit drop analysis of the fully loaded container. The container used a variety of composite layups from thin to thick solid laminates and whenever possible in larger flat sections, a 25mm thick sandwich laminate. The composite construction was based on glass-plies that were vacuum-infused with a non-flammable resin. The overall container size was 2.5x3.2x10m and was split into bottom and top shells. An aluminum extrusion with an inner O-ring was used to create the closure around the perimeter of the top and bottom shells. The container was seal using a series of latches. 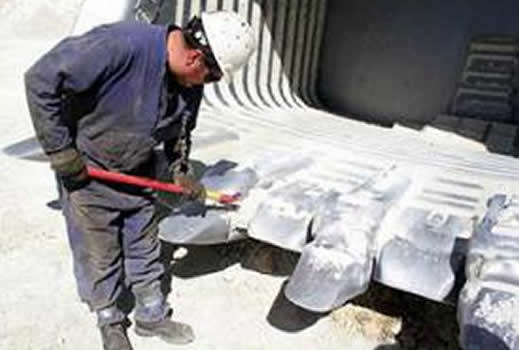 To reinforce the composite at strategic loading points, other aluminum structures were implemented. This complete assembly of composite and aluminum components was analyzed under internal and external pressure along with a number lifting and impact loads. Every load case was nonlinear since structural components were preloaded via bolted connections from the closure latches to aluminum reinforcement plates to internal spring mounts. Extensive optimization was done on the composite structures based on experimental data. 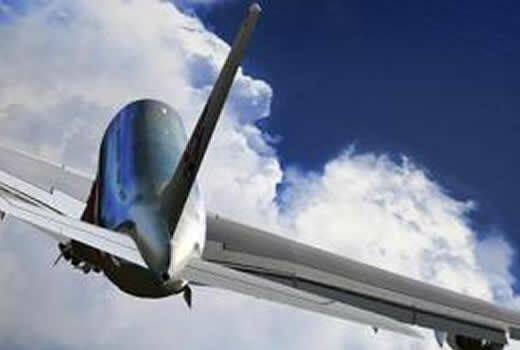 The composite material information was developed based on the validation of FEA models to test data. Such close linkage allowed greater confidence in the development of composite transition regions between solid laminate and the sandwich regions and of course in the interpretation of composite stress results. Progressive ply failure was an important modeling metric since damage was allowed by the specification but not complete composite failure. Thus the container could be loaded higher than a standard linear composite analysis would allow since some individual ply failures were tolerated. In many load cases, the model was preload via an implicit analysis and then allowed to impact using the explicit solver within LS-DYNA. The drop tests followed standard procedures for impacts on rigid surfaces. What was unique was also modeling the cargo on a bed of springs based on the manufacturer’s nonlinear force versus deflection curves. It seemed that every simulation skill set was used on this project from CFD to Nonlinear Implicit to extreme nonlinear transient dynamic. The container has passed CDR and is now heading into manufacturing. Mechanical couplings for drivelines are as simple as the classic U-Joint or if damping is necessary, one can insert large rubber disks between opposing steel plates or use incompressible fluids (e.g., oil) between opposing blades or with this one client, use a stack of 20+ bolted disks to efficiently transmit torque while allowing for slight mis-alignments between the shafts. It is one of the joys of our work that we see such broad ranges of mechanical systems and we are often amazed at the cleverness of our client’s approach to solving engineering challenges. To meet their high-cycle fatigue requirements, the analysis was run using a nonlinear approach to capture contact between the plates under the bolted regions as torque was applied to the main shaft. Given the large stack-up and the requirement to have the shafts slightly mis-aligned, no symmetry could be exploited and the model ended up having nearly a million DOF. The fatigue model for the material was based on 304 SS and presented its own difficulty given that at millions of cycles the run-out stress can be as low at 70 MPa (10,000 psi). Results from the model showed that the disk pack would pass with margin under the specified axial mis-alignments and as far as we know, as of this writing, is still in service in multiple locations. Modeling the dynamic interaction of vibrating, submerged structures was and continues to be a topic of research. One of the more famous studies was done by R.J. Fritz “The effects of Liquids on the Dynamic Motions of Immersed Solids” in 1972. In our published work (14th International LS-DYNA Users Conference: Interactive Dynamic Analysis of Subsea Lifting Ropes), we show how one can couple the dynamic forces of fluid movement (drag and vortex shedding) to the transient, dynamic response of a submerged high-strength plastic rope. Although rather technical, a user-routine was written that coupled the ropes dynamic movement to the calculation of fluid forces that were then fed back into the model in real time to dampen or excite the ropes dynamic response as it was tensioned and moved through the sea. Although one could do a CFD fluid-structure-interaction (FSI) type simulation with many commercial codes nowadays, the scale of our project was to simulate the behavior of a five kilometer (5 km) long submerged haul rope. To attempt this using a CFD-FSI approach would not quite be possible given that we needed to make hundreds of runs to investigate different loading, sea currents, ship movement and the potential for rope-to-rope tangling during the lift operation. It was fascinating work and showcased the ability to model FSI without necessarily having to tow along a CFD code. If it flies, then most every manufacturer is concerned about minimizing the weight of their design. This LS-DYNA consulting project optimized the structural performance of a metal stand used to transport jet engines between the United States France. A key requirement was to demonstrate that the jet engine would not come flying off the stand and crash into the plane’s cockpit during a 9g crash event. Besides the crash testing, the stand had to withstand a 12” drop along with lateral impact load of 3g (lifting load case). These dynamic loads were then followed by static testing where the stand was pulled, pushed and lifted using a triaxial load set. Lastly, a normal modes analysis was done of the complete assembly to ensure that it would not get excited during ground transport. The FEA analysis work was validated against the 3g lateral load and the most severe triaxial load. With this validation, the client was able to use the simulation results to demonstrate compliance with the other specifications. It should be mentioned that during the course of this investigation and working collaboratively with the client, we were able to reduce the weight of the frame by around 30% while exceeding the mechanical performance of their original stand. A rather old-style multi-component medical instrument was reengineered into an inexpensive all-plastic device. The design required several stages of movement from activation (a twisting snap-fit motion) and then application (pushing and sliding). Since the design was a one-use application, it didn’t matter if internal components were deformed. Given the highly nonlinear behavior of the system and its dynamic operation during use, LS-DYNA was used to analyze the system. 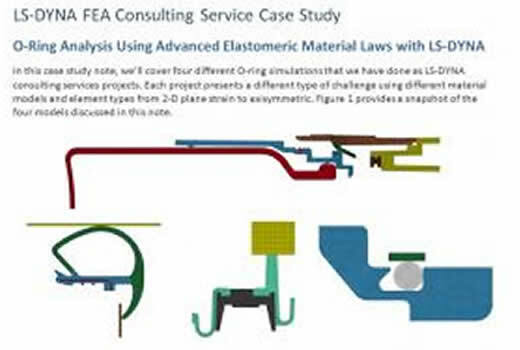 This LS-DYNA consulting project presented several difficulties due to the variety plastic materials that were required to be modeled from copolyesters, nylon 12, Zylex 20% filled to three different grades of polypropylene. The snap-fit behavior was perhaps the most challenging since plastic-against-plastic contact becomes quite sticky at higher contact pressures. An integral part of this device was an o-ring seal. 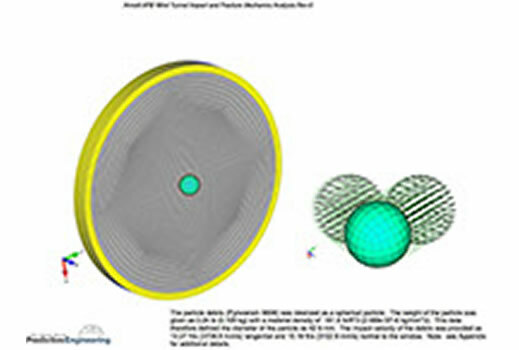 The seal was modeled using a basic rubber material law and the simulation work was used to determine the sealing pressure given various sizes of O-rings. Given that this device was to be manufactured in the millions, sensitivity and optimization studies were performed. We were able to show the quantitatively how the different grades of plastic could push the operational behavior into statistically unsatisfactory regions and in other studies how our client could use the most inexpensive plastic with no degradation in performance. At the end of this study, abuse loading was investigated where the device was loaded to its failure point. Plastic material failure was simulated using a combination of tensile, compressive and shear failure data. The LS-DYNA simulation was compared against experimental data and found to be in good agreement. This LS-DYNA consulting effort let our client decide with confidence on what materials to use, what were the key design features and how the device would behave in normal operation and under abuse loading. The engineering of airplane seats is quite complex due to competing demands for lightness and the ability to survive a 16g sled test. Experimentally, a 50% percentile dummy or anthropomorphic test device (ATD) is strapped into the chair and then subjected to a 16g acceleration pulse with a half-sine pulse width of 0.18 second. The test procedure is well defined under 14 CFR Part 25.562, Amendment 25-64 and JAR Part 25.562 with guidance given under SAE AS8049 Rev. A and for the ATD under 49 CFR 572. In our work, Predictive constructed a detailed model of the airplane seat within Femap. After some debugging and verification analysis of sub-component models, the FEA structural model was combined with a simplified dummy model (LSTC Hybrid III Adult Fast, 50th percentile male) for the complete test simulation model. The crash test load consists of the application of a 16g half-sine wave acceleration pulse through it leg supports. The simulation was run for 360 milliseconds with run times of around 45 minutes. Sensitivity runs were performed to assess the effects of mass scaling, hourglass, element formulation, damping, sliding interface energy and contact behavior. Some runs were also made using the double-precision version of LS-DYNA. In all cases the results converged to nominal behavior. At the end of this effort, the client allowed us to view the video of the sled test and everyone was quite excited to see a tight correlation between LS-DYNA model and sled test. Subsequent to this qualitative correlation, the model showed good quantitative correlation to load cell data and noted structural damage in the prototype. Robotic endoscopic surgery requires the use of highly engineered steel micro-cables and helical hollow strand (HHS) tubes. The wire tube is the main structural component that allows endoscopic probes to navigate through arterial systems. It must be flexible yet be capable of sustaining high torque loads without buckling. A LS-DYNA model was constructed and correlated to one set of experiment data. Based on these results, two other HHS models were created and shown to correlate directly to the experimental results. 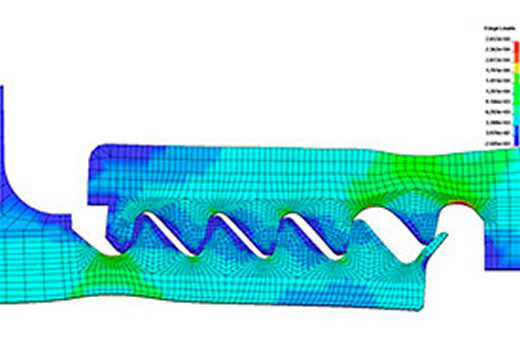 This out-of-the-gate correlation demonstrates that FEA modeling can be a predictive tool for the development of the next generation of these tools. Two potential design concepts were investigated. Both concepts used aluminum construction materials and a common side rail but the material strength, design weight and fabrication cost differed. The investigation started with linear static stress analyses of the two designs under a variety of operational loadings. Once the superior traction grate design had been selected, it was time to test the maximum load carrying capability of the complete ramp assembly. LS DYNA was used to handle the nonlinear nature of this analysis as the material yielded and the structure buckled. This project work was sponsored by the US Army’s Natick Soldier Systems Center to investigate additive manufactured lattice structures for improved blunt impact protection for helmets. Large, skid mounted, mobile generators are quite common to supply emergency back-up power at military bases or in remote locations where the local power grid may be unstable. The power output of these generators can range from hundreds of kW up 3 MW. Efficient FEA analysis of elastomeric (rubber and silicone) O-Ring systems for sealing pressure verification and mechanical functionality. Analyze the complete loading sequence of a large composite container from static pressurization loads to PSD transporation loading to rail impact to transient dynamic drop testing. This case study presents several examples where we have used the discrete element method (DEM) and smooth particle hydrodynamics (SPH) to apply sand and rock, mineral, organic (bird strike) and fluid loading to complex nonlinear dynamic finite element models. 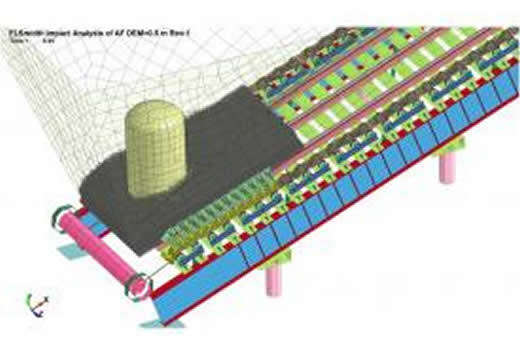 A complete LS-DYNA anslysis model was constructed of a drop-tower simulation. Determine the survival probability of a fused silica window subjected to a large particle impact event within a hypersonic wind tunnel using numerical methods (LS-DYNA) and fracture mechanics theories for brittle solids. This case study presents several consulting projects where LS-DYNA was used in the nonlinear analysis of plastics, elastomers and foams. A turbine system was simulated to improve its burst containment capabilities. The LS-DYNA work was correlated to experimental data and was found to accurately predict the burst containment process. A projectile penetration study was conducted to assess the protective capabilities of a standard aluminum skinned foam sandwich panel. 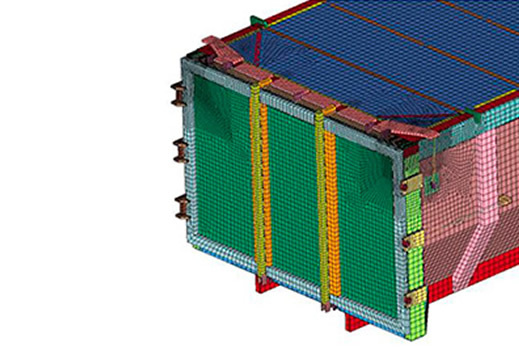 The LS-DYNA FEA simulation showed that the panel would provide more than sufficient protection against falling mortar segments. The U.S. Department of Transportation specification 49 CFR 173 calls out a rigorous series of testing procedures for containers that are used to transport hazardous waste. The genesis of this project came about to validate a prior consultants work indicating that the thread design of a new device would fail right at the design load of the instrument. Cargo nets are rather mundane industrial things. We see cargo nets in the back of pickup trucks, tying down cargo on large trucks and, if we are passing by a military airport where cargo is being transported, cargo nets are everywhere there is a shipping pallet. 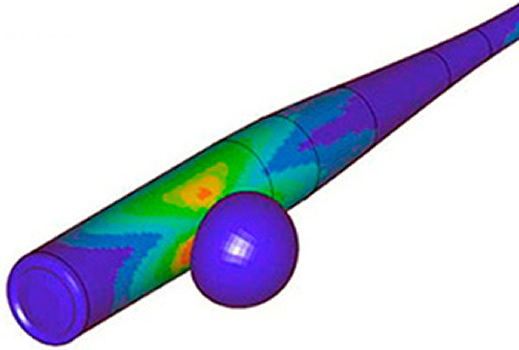 To understand the mechanics of aluminum bat/ball interaction. A FEA model was constructed of an aluminum bat based on geometric and material property data supplied by the client. Under Federal Motor Vehicle Safety Standards (FMVSS) 210, 222 and 225; automotive and bus seats are tested under extreme conditions to ensure that the seat will not fail and cause human injury.